Ellie has been teaching Pilates in Kensington and Chelsea since 1999 and specializes in teacher’s training programs. Ellie has qualified and enriched the technique of many teachers since 2000. I found about the Pilates method in 1997. 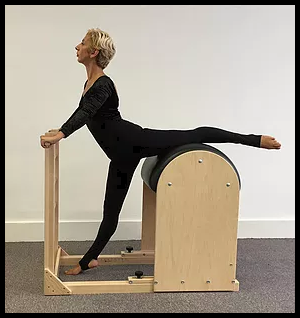 I joined the intensive Body Control Pilates teacher’s training and found out about Jenny Colebourne-a teacher of the highest standards-training program at the Ilium Centre in Athens. I trained intensely for 2 years and qualified from both programmes. I moved permanently in London in 1999 and started working with Gordon Thomson at his studio in South Kensington. Mitsi Pippa guided the first steps in my professional life in London as I continued training with Adriana Zachariou in Athens and Helge Fisher Brighton. From early on I had a flair for sharing the knowledge I received so generously from my teachers. I joined Body Control Pilates’ training team, supervised and signed off teachers and taught modules on courses for them until 2005 when I had my daughter. In the following years I formed a very specific, independent way in which I wanted to deliver the teacher’s training. I co-founded Pilates Body Europe in 2006, designed a new structure for an education program, comprehensive and continuous. I wrote and taught 3 long courses on Pilates equipment and a number of workshops. Between 2006-2014 taught over 30 Certified Courses and a number of workshops in London, Portugal, Scotland, Athens, Vienna and Monaco. I qualified many teachers on the Cadillac, Reformer and the Wunda Chair. During those years I was the manager in Body Control and Rehabilitation Studios (17 Queensbury Mews West, South Kensington). In 2014 I founded Pilates Education and Research Ltd. I taught from Trevor Blount’s studio in South Kensington from October 2013 until December 2016. I opened our first premises in Gloucester Road, London for Pilates Education and Research Ltd in 2016 and dedicated myself to this wonderful studio and project.